If you are in Korea or visiting Korea, you’ll definitely have to handle with South Korean won (South Korean currency) .You will probably be spending a lot of your Korean money everyday, and you will be seeing the faces on the money everyday as well, right? So, it would be a lot better when you know who they are, and how they mean in the great Korean history! The man on the front is Toegye Yi Hwang (퇴계 이황), who was a distinguished Korean Confucian scholar of the Joseon Dynasty. Toegye was very intelligent, he learned the Analects of Confucius at the age of 12, and Yi Hwang was the author of many books on Confucianism. He was also very talented in calligraphy and poetry, he liked writing a collection of sijo (시조), which was a popular type of poetic form in Joseon Dynasty. Toegye Yi Hwang was a very prominent politician as well, he held many different positions in the government along with his disciple, Yulgok Yi-Yi (The man in the 5,000 won bank note). He served four kings including, Jungjong, Injong, Myeongjong and Seonjo during his forty-year long political career. When you turn the 1,000 won around, you’ll see a painting of Dosan Seowon, which is a private Confucian academy found by Yi Hwang. 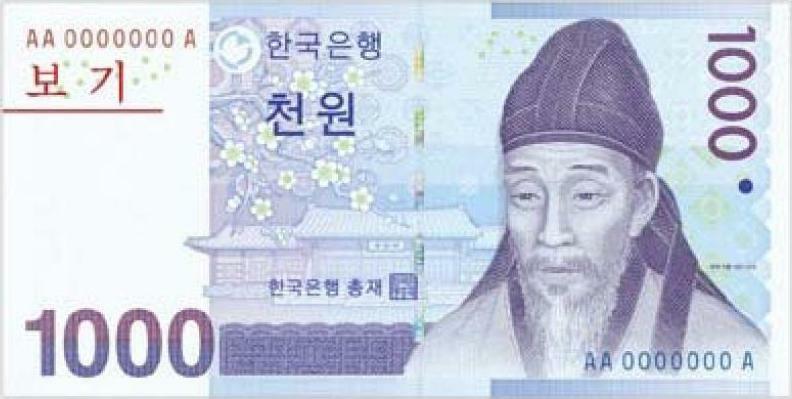 The man on the front is Yulgok Yi Yi (율곡 이이), who was a respected politician and one of the two famous Korean Confucian scholars from the Joseon Dynasty along with his teacher, Toegye Yi Hwang (The man in the 1,000 won bank note). This man was really smart as well, he was reading by 3, by 7 he was done with his Confucian classics lessons. He passed the Civil Service Literary exam when he was 13 years of age and when he was 16, he decided to devote himself to the study of Buddhism in Kumgang-san (금강산) after the death of his mother, Shin Saimdang (The woman in the 50,000 won bank note). When you flip around the 10,000 won you will see 3 different scientific inheritance from the Joseon Dynasty. Which includes, the Cheonsang Yeolcha Bunyajido (천상열차분야지도), which is a 14th century Korean star map, a celestial globe (혼천의) and the Bohyunsan Optical Astronomy Observatory (보현산 천문대). The woman on the front of the 50,000 won bank note is the mother of Yulgok (The man in the 5,000 won bank note), her name is Shin Saimdang. She is the first female to appear on a South Korean bank note, and is also the first mother in the world to appear on a bank note along with his son. She was a famous Korean painter, calligrapher, poet and writer in the early 1500s. She is also popularly known for being a good wife and a wise mother. Shin Saimdang did many things that most women could only dream of doing back in the 1500s. For example, she had no brothers so she acted as her parent’s eldest son and had many man’s responsibilities, such as receiving education and taking care of her aging parents. If you turn the 50,000 won bank note around, you will see a painting of the Japanese apricot flower which was one of Shin Saimdang’s favourite out of the four gracious plants, the painting was done by Eo Mongyrong (어몽룡) in Joseon Dynasty. ₩ 1 (won) – coin :: Mugunghwa (무궁화/ Rose of Sharon) – Mugunghwa is the national flower of South Korea. ₩ 5 (won) – coin :: Geobukseon (거북선/ Turtle Ship) – A type of large ironclad warship invented by Yi Sun-Shin.